Can I view my page flip magazine with single page? The flip book I created with A-PDF FlipBook Maker is really sparkling and with awesome page turning effect. And I would like to make a presentation with the flipbook. So I don’t want others to see what I will take next page when I am talking. Then can I view my page flip magazine with single page? 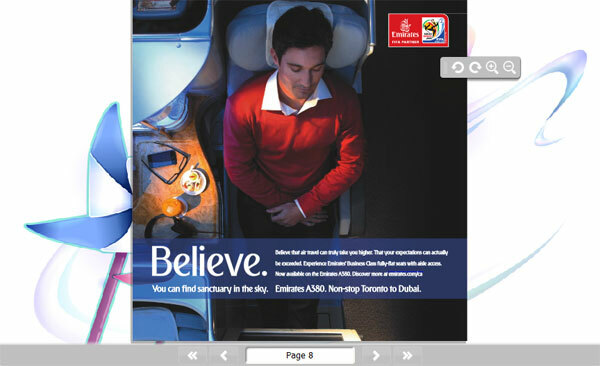 With A-PDF FlipBOOK Maker, you can read the page flip magazine with single page easily. For one thing, you can read the flip magazine with slide effect. It means reading the documents with sliding pages and pages. For the other thing, the flash magazine can be viewed with page turning and flipping effect. It seems that you are reading a realistic page turning book. Besides, you can choose to read the flip magazine with slide or flip effect based on your actual needs. Here please check the details to view flip magazine as single page. Step1: Add New PDF File. Download the Software and then run it to continue adding PDF file to edit. 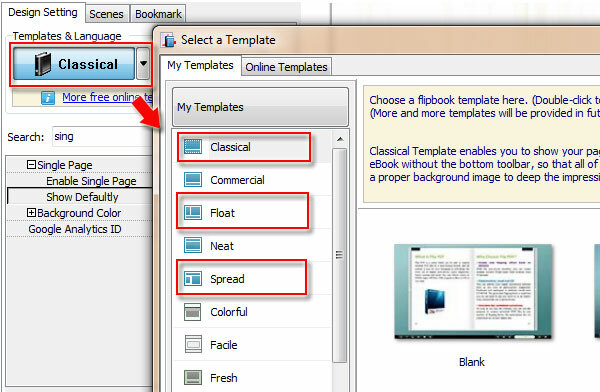 Then move to design setting and click template button to select a proper template. You should notice that only Float, Classic and Spread support slideshow effect. 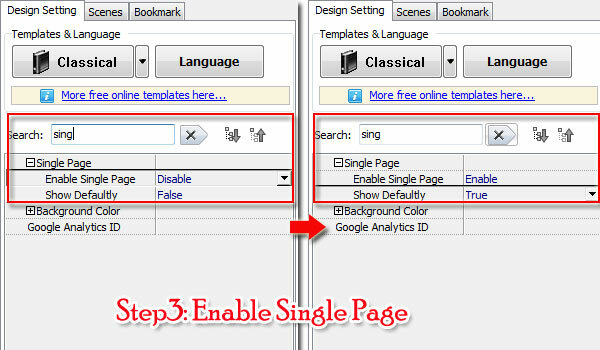 Step3: Get Enable Single Page Button. Enter the keywords "Single" on the search box and get the "Enable Single Page" button quickly. Select "Enable" from "Enable Single Page" and choose "True" from "Show Default" and then click "Apply Change" to read the document with slideshow effect.